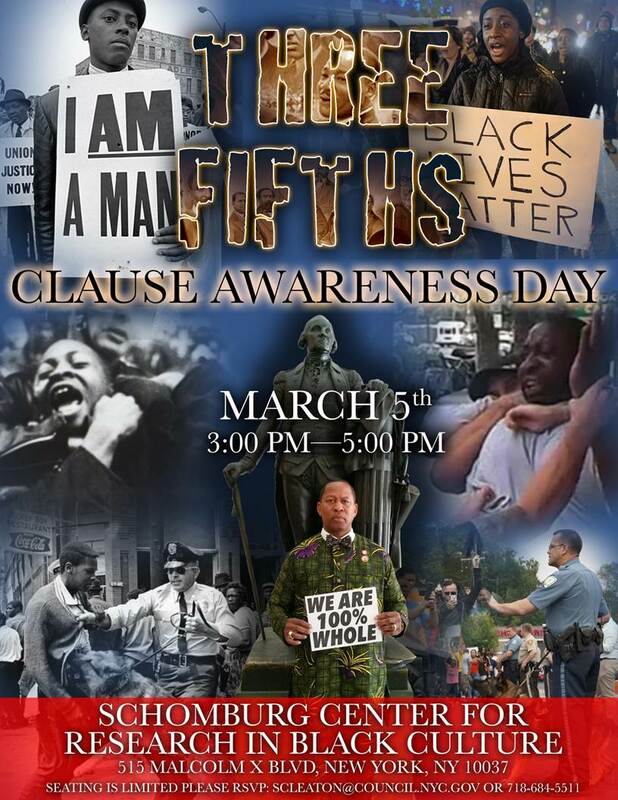 On Sunday, March 5, 2017, the City of New York will observe for the first time “Three-Fifth Clause Awareness Day.” As a part of this observance a special program will take place at 3 P.M. at The Schomburg Center for Research in Black Culture, 515 Malcolm X Blvd, Manhattan. The Three-Fifth Clause (Article 1, Section2, of the U.S. Constitution of 1787) was demanded by Southern supporters of slavery as a way of increasing their congressional representation and political power. They wanted slaves to be counted as full persons but settled on three-fifths. People of African descent would have had no real rights either way. The three-fifths clause was enforced until the post-Civil War 13th Amendment freed all enslaved people in the United States, the 14th amendment gave them full citizenship, and the 15th Amendment granted black people the right to vote. However, the “three-fifth clause” language was never removed from the Constitution. Last year, Council Member Andy King introduced legislations in the City Council calling on the federal government to add an amendment to add language that directly negates the Three-Fifth Clause by stating that African-Americans are 100 percent whole individuals and declare March 5th as “Three Fifth Clause Awareness Day” in New York City. The New York City Council unanimously passed both legislations and March 5, 2017, begins the official observance of “Three Fifth Clause Awareness Day” in New York City. This FREE event will include a panel discussion with prominent elected officials and community leaders and exhibits.